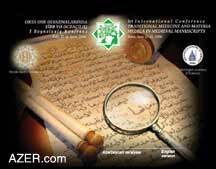 The First International Conference on Traditional Medicine and Materia Medica in Medieval Manuscripts was held in Baku on June 12-16, 2006. This was the first international conference on the history of medicine ever to be held in Azerbaijan. The Inaugural session was opened by First Lady Mehriban Aliyeva, Goodwill Ambassador of UNESCO and President of the Heydar Aliyev Foundation, which organized and sponsored the event with Washington Academy of Sciences (WAS). Dr. Farid Alakbarli, President of the Azerbaijan Association of Medical Historians, Dr. Alain Touwaide of WAS (U.S.) and Anar Alakbarov, Executive Director of the Heydar Aliyev Foundation, served as co-chairs. The impetus for the event was UNESCO's recognition of three manuscripts kept at the Institute of Manuscripts that successfully were registered in the "Memory of the World" Program in 2005. UNESCO launcAZER.comhed this program to guard against collective amnesia and to call upon the preservation of the valuable archive holdings and library collections all over the world to ensuring their wide dissemination. Above: (Left) New Book: "Medical Manuscripts of Azerbaijan" by Dr. Farid Alakbarli, edited by Betty Blair, sponsored by the Heydar Aliyev Foundation in Baku, 2006. 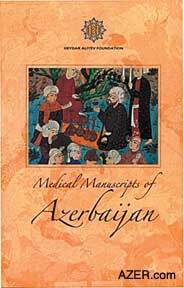 This is the first time that a substantial book about Azerbaijan Medical Manuscripts has been made available in English. An extremely attractive volume, this 248-page paperback is chock full of historical content and lavishly illustrated in color. Contact Dr. Alakbarli for copies: alakbarli_farid@yahoo.com. Right: New DVD developed by the Heydar Aliyev Foundation highlighting Azerbaijan's rich collection of Medical Manuscripts kept at the Institute of Manuscripts. Superb quality. The manuscripts which were included in the Registry were copies of Canon by Avicenna (1143), Zakhirai Nizamshahi by Rustam Jurjani (13th century) and Surgery by Zahravi (11th century). Conferees caught a glimpse of these rare manuscripts, which were on display at the Conference. UNESCO's Abdel-Aziz Abid, Memory of the World Program Director also flew in to attend the event. Above: (Left) Illustration from the Book described in Photo 2. Miniature from "Ikhtiyarati-Badii" by Ali ibn Huseyn Ansari. Copied by hand in 1686 and kept at the Institute of Manuscripts in Baku. Middle: Avicenna's "Canon" copied in 1143 and kept in Baku's Institute of Manuscripts. This is one of three manuscripts in Azerbaijan that qualified for registry in UNESCO's program "Memory of the World" because of its uniqueness and rarity. Right: "The Book of Surgery and Instruments" by Abulkasim Zakhravi dates to the 13th century. 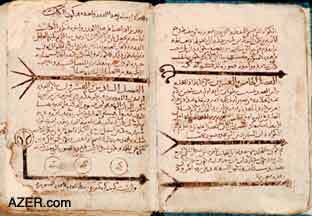 This manuscript also is registered in UNESCO's Memory of the World program. Representatives from 22 countries participated in the Conference including historians from Algeria, Bangladesh, Belgium, Egypt, Estonia, France, Germany, Greece, India, Iran, Israel, Italy, Russia, Syria, Turkey, UK, and the USA. Above: (Left) Website of the First International Conference on Traditional Medicine and Materia Medica in Medieval Manuscripts which was held in Baku, June 12-14, 2006. 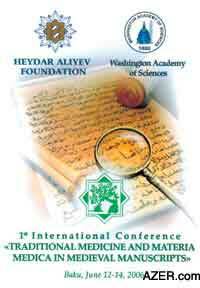 The Conference was sponsored by the Heydar Aliyev Foundation and Washington Academy of Sciences. Site is in Azeri and English at www.medical-manuscripts.az. 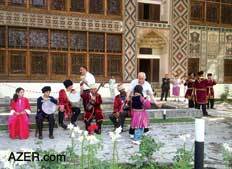 Right: Conference attendees visited the Khan's Palace in Shaki in northwestern Azerbaijan where traditional musicians and young dancers entertained their guests. Guests also went on several organized tours while in Baku, visiting Baku's Medieval Inner City and the glorious architectural gems of the Oil Baron period. At the end of academic sessions, conference participants visited Azerbaijan's region with tours in Yevlakh and Shaki where they toured the Khan's Palace,the Caravansarai and the recently restored Kish Church. Above: Dr. Farid Alakbarli (second from left), one of the co-organizers of the Conference along with international guests at the Heydar Aliyev Foundation Building. The first session was opened by First Lady Mehriban Aliyeva, President of the Heydar Aliyev Foundation and International Goodwill Ambassador to UNESCO. 1. Dr. Abdel-Aziz Abid (France), Director of the Memory of the World Program of UNESCO. 2. Professor Athanasios Diamandopoulos (Greece), President of the International Society for the History of medicine (ISHM), physician, and distinguished historian of medicine and archaeologist. 3. Dr. Alain Touwaide (USA), Secretary General of ISHM and vice-president of the Washington Academy of Sciences. 4. Dr. David Wright (UK), Editor of Vesalius, Journal of ISHM. 5. Prof. Jean-Pierre Tricot (Belgium), former President of ISHM and well-known specialist. 6. Dr. Abdul-Nasser Kaadan (Syria), Secretary General of the International Society for the History of ISLAMIC Medicine (ISHIM). He is a specialist in medieval surgery and wrote his PhD on Abul-Kasim Zakhravi's book on Surgery which is in Baku's Institute of Manuscripts and now registered with UNESCO's Program Memory of the World. 7. Dr. Axel Helmstaedter (Germany), Secretary General of the International Society for the History of Pharmacy, University of Marburg. 8. Professor Ayshegul Demirhan (Turkey), President of the Turkish Society for the History of Medicine. 9. Professor Nil Sari (Turkey), Vice-President of the Turkish Society for the History of Medicine, and recognized as the leading specialist in medieval medical miniatures (paintings).